Chana and Rabbi Levi Banon have served the Jewish community in Casablanca for a decade. When Rabbi Levi and Chana Banon decided to move to Casablanca, Morocco, in 2008, they were hardly the first shluchim (emissaries) to do so. Chabad has had an active presence in the North African kingdom since 1950, when the local Jewish population numbered 350,000 strong. Yet by the time they arrived nearly 60 years later, the Jewish communities in dozens of cities and towns had gone; Moroccan Jewry was a shadow of its former self. Today, the majority of the country’s Jews, estimated to about 3,000, are concentrated in Casablanca, a bustling metropolis of 3.4 million. Despite its reduced size, the Moroccan Jewish community remains fully functional, active and vibrant. 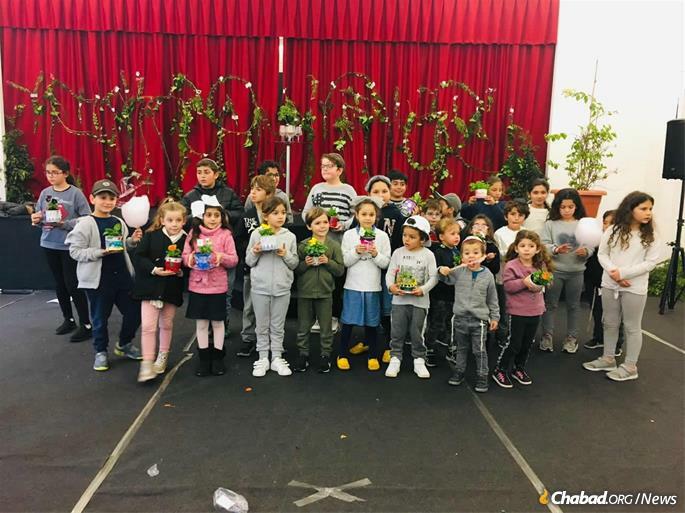 In this interview, Chana Banon, a mother of five and an active community leader, shares what it’s like to foster Jewish life in a small Jewish community in a majority Muslim nation. Q: You are from Brooklyn, N.Y., and Rabbi Banon is from Montreal, Canada. How did you end up in Morocco? A: We first came as newlyweds. Although my husband grew up in Montreal, he was actually born in Morocco, and his grandmother still lives here. We came to visit her, and everywhere we went, people were asking us to stay and form the next link in the chain of Chabad emissaries that has done so much here for generations. We decided to experiment with a summer camp. We told ourselves that if 20 children enrolled, it would be a sign that there was work here for us. By the time that first summer ended, we had 65 kids in camp, and we knew we would be coming back. Today, we have a kiddie camp, a boys’ division, a girls’ division and teen division with a total of 150 kids coming for summer and winter camps. Q: Was the language a challenge for you? How about the culture? A: The Jewish community here speaks mostly French, and Arabic is more prevalent on the street, so you need to speak both. My husband grew up speaking French and had some Arabic expressions from home as well, so he was comfortable from the start. I, on the other hand, knew neither language, but I managed to learn quickly. I can read French as well, but I still need to learn to read Arabic, something I hope to do someday. One of the culture shocks for me was the food. Before our first Rosh Hashanah, I made three types of kugel, and no one touched them. Today, I cook a fully Moroccan meal: fish tagine for Friday night and dafina (a slow-cooked Moroccan Jewish stew) instead of cholent for Shabbat day. Another thing to get used to is Ramadan. For a month, everything is different. People are edgy during the day because they are fasting; in the last hour before the fast ends, the streets are jammed as everyone is out shopping for their break-fast. Once the fast ends, the streets are abandoned since everyone is inside feasting. In general, people here dress more modestly than in Europe, and religion is a very visible part of daily life. There are other differences, but most of them are easy to get used to. The people here are warm, friendly, welcoming and very courteous. 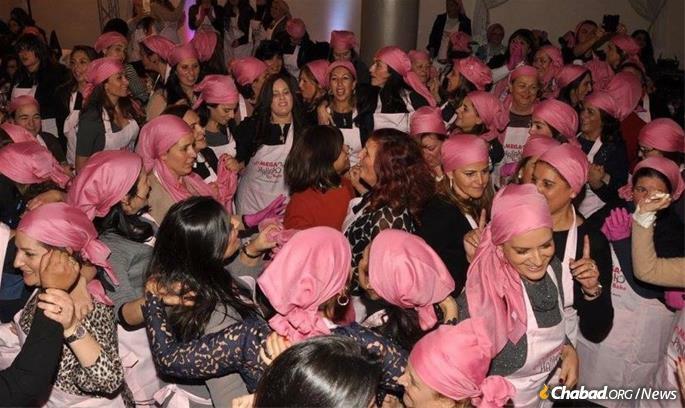 Joyous dancing after Morocco’s annual ‘Mega Challah Bake,’ organized by Banon and held at the Chabad Beth Rivkah campus. Q: What is the position of the Jewish community within the wider population? A: Jews have been living here for 2,000 years, and visitors are often surprised to learn that the Jewish community is safe, cared for and relatively secure. In large part, this is due to the royal family, which is very respectful to the Jewish people, and considers them close friends and an important component of Moroccan society. Like in Europe, many Jewish institutions are not marked, and there are less visible signs of communal life than in the United States, but the Rebbe once referred to Morocco as a malchusshelchessed, “a kingdom of kindness,” and we live very well with our Muslim neighbors. Q: Recognizing that the Jewish population is tiny compared to what it was in living memory, is there a sense of despair within the Jewish community? A: It is true that the community has shrunk, and people often worry if there will be anything left in a few decades, but we focus on what there is. We came here to serve a community of several thousand, in addition to the many thousands of tourists who come by on business, and to visit the many Jewish cemeteries and other historical sites. We serve young families, many of whom were educated in the United States, Canada or France and have now moved back to Morocco, and that keeps us more than busy. Q: You came to Morocco, where you joined a team of senior Chabad emissaries. How is that? A: The Chabad emissaries have been beloved by virtually everyone here for generations, and my husband’s family was no exception. Rabbi Sholom Edelman was the sandek at his bris, and he still is my father-in-law’s mentor in many areas. Mrs. Reizel Raskin, whose husband, Rabbi Leibel Raskin, passed away in 2004, is an invaluable source of guidance to us as well. More importantly, their work paved the way for us. People here know Chabad, appreciate Chabad and welcomed us with open arms as a result. When kids learn songs in our camps, their parents sing along since they learned the same tunes from Rabbi Raskin in their childhood. The emissaries here really cared for every aspect of people’s lives. When poor children from villages came to the Chabad boarding schools, the emissaries washed them, fed them and looked after them. They are revered in the community, and this helped us integrate seamlessly into the communal infrastructure. Children gather for an event in the Chabad synagogue. A plaque on the right honors the memory of Rabbi Leibel Raskin. Q: Does the programming you provide compare with that of Chabad couples in the English-speaking world? A: On a most basic level, things are the same. I share ideas with my sisters, who serve communities in the United States, and there is a lot of commonality in the classes and activities, except for the difference of language, of course. But there are some differences. There, you can put out coffee and cake for a class, and people are thrilled. Here in Morocco, when people host, they put out a three-course meal, and we do the same. Q: How hard is it to get kosher staples in Morocco? A: There is kosher food here, but we do a fair amount of importing from the United States. Our glatt kosher meat, chalav Yisrael dairy and snacks all come from America. That said, we have what we need and are able to host regularly. We have ladies’ Torah and tea every week in our home, and our Shabbat table is always surrounded by guests from all over the world. Q: What’s it like for your children? A: Our children grew up here and have friends. While the younger ones go to a local Jewish school, our three oldest study as part of the Online Shluchim School. They are part of the English-language division, which keeps American hours, so they are “in school” from late afternoon until evening. Another plus for them is that my husband’s grandmother, whom we call mami, lives nearby and comes almost every Shabbat. 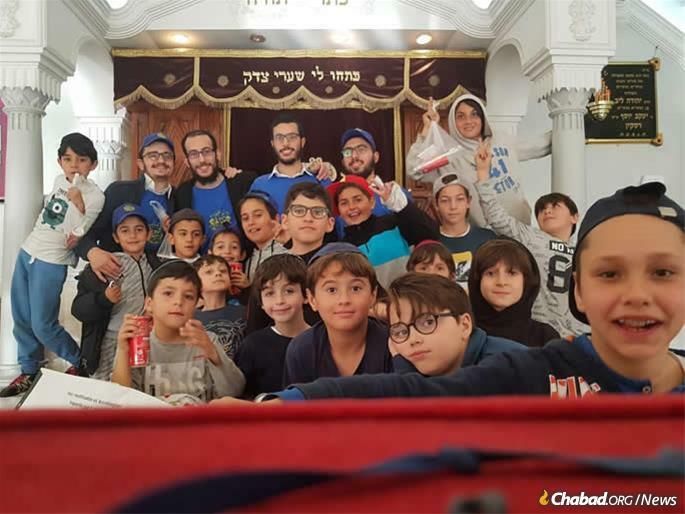 Children are always the focus at Chabad of Morocco. Q: On the subject of your husband’s family, can you tell me more about them and their journey to Chabad? A: My father-in-law, Rabbi David Banon, today a leading rabbi in Montreal, grew up in Casablanca and was very close to the former chief rabbi, Rabbi Shalom Messas. He originally went to Gateshead yeshivah in England, but wasn’t satisfied there. Rabbi Messas suggested that he study Chassidus with Rabbi Sholom Eidelman, and he soon went to learn in the Chabad yeshivah in Brunoy, France. Through the Rebbe’s advice, he became a rabbi. My mother-in-law is also a native of Morocco, who had learned at the Chabad seminary in Yerres, France, and was teaching at the Chabad school in Casablanca when they met. The family left to Montreal when my husband—the fourth of seven children—was a toddler, but they kept their ties strong, so we really picked up where they left off. Q: I am sure there are difficult moments. What keeps you going? A: We came here because we were needed, and that need is as strong today as it was a decade ago. The Rebbe would emphasize that everyone has something unique to contribute, and we are fortunate to know that this is the place where we can contribute in our own way. 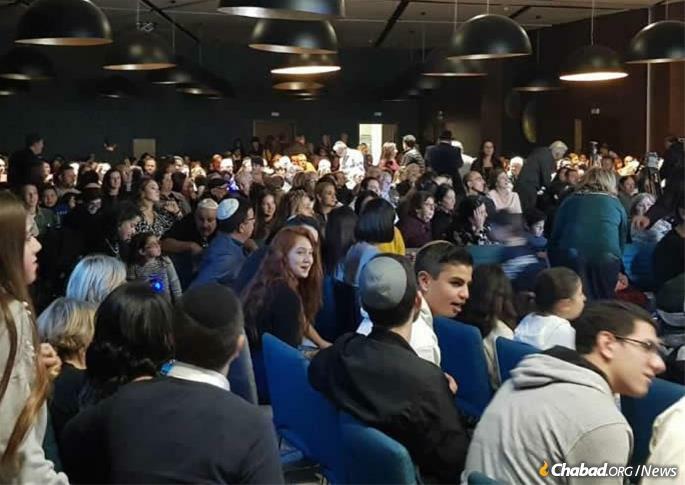 Hundreds attend a Chanukah menorah-lighting and event.